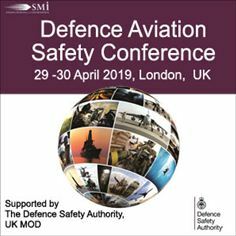 SMi Group Reports: The Defence Aviation Safety Conference will convene in London on the 29th - 30th April 2019. Rolls Royce and Tudor Tech have just signed up to sponsor, exhibit and present at the Defence Aviation Safety Conference, taking place in London, UK on the 29th and 30th April 2019. Supported by the Defence Safety Authority and the Military Aviation Authority - UK MOD, the Defence Aviation Safety Conference will bring together senior military leaders with responsibility for safety in the aviation domain as well as international defence experts from government and industry. Sponsors and Exhibitors, like Rolls Royce and Tudor Tech, will brand themselves in front of those who will be shaping the next generation of aviation safety. Organisations that wish to sponsor or exhibit at the Defence Aviation Safety Conference can contact Sadia Malick, Director on +44 (0) 207 827 6748 or smalick@smi-online.co.uk for packages available. Latest organisations to register include: US Army Aviation, USMC, DE&S and more.